A youthful cast brings Rossini’s immortal comedy to sparkling life, led by Christopher Maltman as Figaro, the resourceful barber and man-about-town of the title. The lovely Isabel Leonard is Rosina, the clever young woman at the center of the story, and Lawrence Brownlee sings Count Almaviva, the man who loves her and—with Figaro’s help—rescues her from the house of her elderly and smitten guardian, Bartolo, played by Maurizio Muraro. 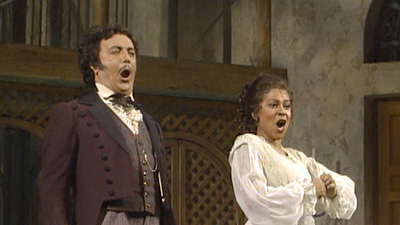 Paata Burchuladze is the bumbling music master Basilio, and rising conductor and bel canto specialist Michele Mariotti leads the Met’s musical forces in Bartlett Sher’s lively production.